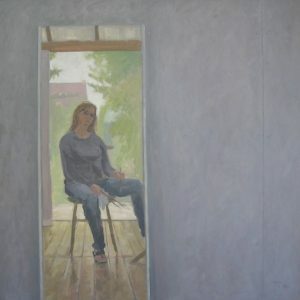 Delia is a figurative painter who lives and works in Ipswich. Her work has been widely exhibited throughout East Anglia, Southern England and London. Delia studied Art & Design (BA Hons) at Suffolk College (UEA) and then Fine Art with Ken Back. A Particularly significant exhibition in 2018 was Strangers on a Shore at Chappel Galleries, Essex. Delia has sent work to the New English Art Club, Discerning Eye (Prize Winner 2015), and had with only isolated gaps, annual acceptances at both from 2006 to date, as well as acceptances at the Royal Academy Summer Exhibition in 2013 and 2016. Delia has been a candidate to become a member of the New English Art Club in 2017 & 2018. Recent successes include being awarded a Purchase Prize at the Discerning Eye and to have been selected for the Lynn Painter-Stainers Prize. Suffolk’s ever changing coastal landscape of enormous skies, wide seas and empty beaches continually inspire Delia’s oil paintings; whether a stormy seascape, a riverbank footpath or a flat expanse of field one or two figures often enliven the scene. Sometimes just the simplified shapes and patterns created by distant fields, trees and houses in the mountains of Bavaria, France and Italy become the subject. Delia’s painting possesses calm, poetic observation coupled with sensitive technique. The work has an uncomplicated quality with enviable light, sure brushwork; a clear vision cleanly painted in close tones with a subtle palette. 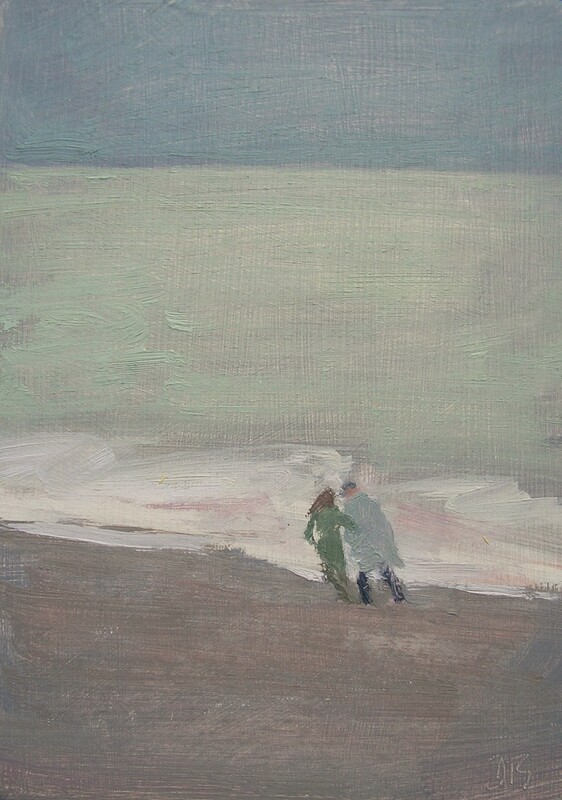 Small paintings worked directly from the subject, figures capturing attitude and atmosphere; people on a beach against a luminous sky, intensely felt, are explored further in her studio at home through the larger work. Using the composition found in the smaller paintings, often combining elements from other studies Delia loves simplifying what is there; omitting unnecessary detail, emphasising close tones and using these elements to evoke a mood or atmosphere. Life drawing is an essential part of Delia’s practise. She organises regular Life Drawing Days in Rendlesham where artists come together and work from the model.